CSV format is another file format used for keeping tabular data. Unlike Excel .xlsx format, this format keeps tabular data as plain text. The main difference between Excel xlsx and CSV files is formatting. Excel xlsx files have formatting features you can use to present data in a visually compelling way. CSV file type doesn’t keep any formatting, just text in its simplest form. The biggest reason why csv files are used is the fact they can be opened in every application and text editor. In this article, we will show you how to export data from Excel to CSV and how to convert Excel to CSV keeping all special characters and foreign symbols intact. The following solutions work for all versions of Excel 2016, 2013, 2010 and 2007. What is the first step to convert Excel to CSV? Open your Excel spreadsheet and click on File menu, and then on Save As. Have in mind, if your Excel spreadsheet contains more than one sheet, only the current sheet will be converted to CSV. If you want to convert all sheets to CSV, you need to save each sheet as a separate Excel (xlsx file). 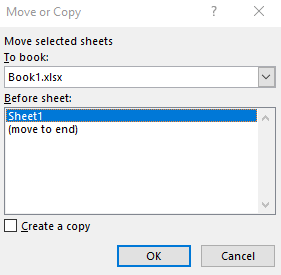 To create a new Excel file from every sheet separately, right click on the sheet and then click on Move or Copy. In the field To book, select a new book. Click OK. In that way you can create a separate workbook from any sheet. The second step is to choose the file type in the field Save as type. You need to find and select CSV UTF-8 (Comma Delimited). The third and alternative step is to rename the file. Otherwise, save it with default name. Finally click the Save button. Note: always check the location where your file will be saved so it gets easier to find the file when you need it. 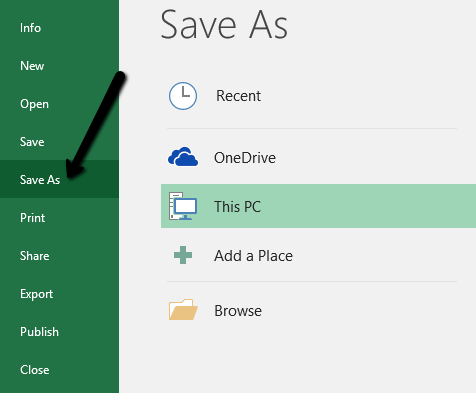 Another thing to have in mind, in the latest versions of Excel, when you go to Save as option, you need to select the location where you want to save the file and then the Save as dialog will appear. Do you want to keep unsupported features? When you hit the Save button, it is possible that the error dialog will pop up. In case your workbook contains multiple sheets, you will be notified that only the current sheet will be saved as csv. Since Excel files have formatting features that cannot be preserved in CSV, you will be notified about this changes. Simply click YES to confirm these changes.